Good Gifts To Your Children – Share God's Grace. My Dad didn’t have any brothers, just a younger sister. He had male cousins who lived a few miles away and for Dad these were his brothers. The cousins had typical boyhoods growing up in Johnson county near the communities of Vesta and Crab Orchard in the 1930‘s. I remember family reunions were filled with stories of boyhood adventures and misbehavior, everything from taking their first smoke to being intoxicated on top of a windmill. When war came they each served even though one of them was underage. Thankfully they all came home, married and each raised a family. This morning (7/24) I learned that Earl, the oldest of the cousins had passed away. He had spent twenty years in the military and even helped me when I had trouble with my discharge from the Army. Earl was the family historian and a man of strong faith. 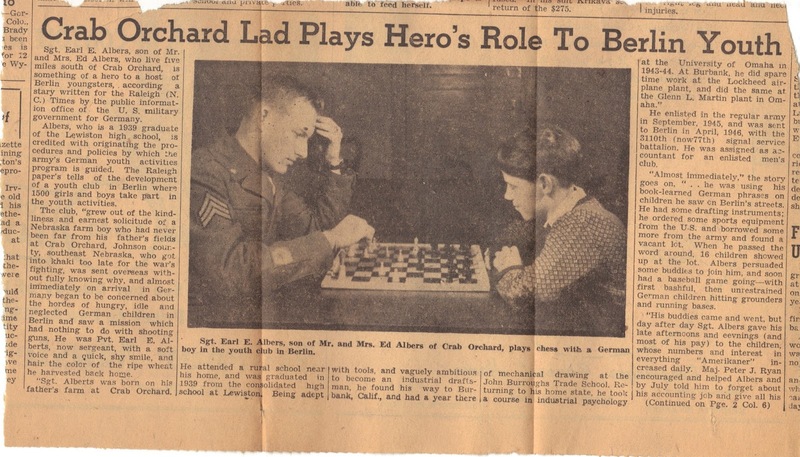 However I never realized how strong his desire to care for others was until last fall when I was going through some of my Dad’s papers and found a newsletter article written in December 1946. Earl was serving in occupied Berlin and he witnessed the children who were living in a devastated city, ruined by allied bombing and the deadly street by street battles between Russians and German soldiers. Earl and another soldier, Maxton L. Frieson, wanted to help out the young boys who were roaming the shattered remnants of Berlin, robbing, pilfering and scavenging whatever they could for themselves and their families. One day they taught two young boys to play baseball. The next day several more showed up. Then a dozen then several dozen. Eventually entire schools were letting their kids come to the two young soldiers. Earl rented a sports field near the military base. Other soldiers volunteered to help and the kids were given opportunities to swim, play baseball, football, water sports and numerous activities. As winter approached Earl found a German officers club and the kids had a warm place to stay. 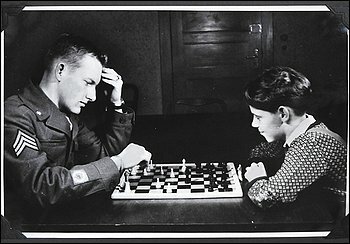 It had begun with two young American soldiers teaching a couple of German boys how to play baseball. By December of 1946 28,000 children had participated in the program. My wife received the news from the wife of one of Earl Nephews. Along with the news was an article from the Washington Post written in 2010 about Earl and his work in Germany. According to the article, at one point Earl telegraphed President Truman asking that he allow “a 14-year-old German girl named Doris Hillenbrand to move to the United States and study English.” Doris Hillenbrand came to America and today her daughter, Karen Gallagher, is a visiting assistant professor of German at Chapman University in Orange, CA. In Nov 2010 she asked Earl to speak to the undergraduates about his work with German children. “ …the occasion also will be a reunion, with several of the Germans whom Albers tutored coming to the campus to see the man who forever made an impact on their lives,” Said Gallegher. I’ll admit I’m bragging a little about my Albers family. Truth is I’ve only met Earl maybe 5 or 6 times in my life. He was someone you took an immediate liking to and people seem to trust him. I can easily imagine those German kids being drawn and trusting in him when they had every reason not to trust American soldiers. To read the Washington Post article click on this link.